2016-2017 GMP Search Committee: Top Row (L-R) Bill Jennison, Lori Tapia, Allison Enari, Mary Lou Kegler, Tom Perring, Young Lan Kim, Monique Crain Spells, Tony Rodriguez. Seated Row (L-R) Jennifer Garbin, Susan Morris, Jackie Bunch (Chair) and Danny Gulden. Progress: In this first communication, we are pleased to inform you that the General Minister and President (GMP) Search Committee of the Christian Church (Disciples of Christ) has been approved by the General Board. 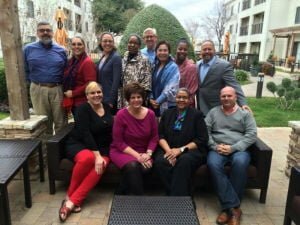 With a sense of humbleness and gratitude for being called to this important task, the committee met from Jan. 15-17 in Dallas, Texas to begin the search process. During this two-day meeting, we prayed with each other for God’s guidance, participated in Pro-Reconciliation/ Anti-Racism training, spent time building covenant with each other, and focused our energies in active listening and engagement. We established a timeline that will take us from writing the position description through interviews and final recommendation of our denomination’s spiritual leader and Chief Executive Officer. Communication: It is important that we engage everyone in the church. Everyone – from the folks in the pews through the General Church. With this communication, we invite you to walk this journey with us. We have established a GMP Search Committee informational page which will serve as a way for you to communicate your thoughts and ideas with us. A questionnaire will be provided to solicit your input and we will be sending updates throughout our process. If you would like to take part in this questionnaire and receive updates, please sign up. Request for prayer: Finally, in recognition of the central role God plays in our process, we have committed to be in prayer with each other on Wednesdays, sometime between the hours of 6 and10 am. Regardless of where we are physically located, this prayer time will spiritually bond us. We invite you to join us in this prayer life.